Wendy’s Chili copycat made with kidney beans, onions, chilis, bell peppers and tomatoes with a spicy chili powder and cumin spices. The perfect copycat! Sadly, I had not made a Wendy’s Frosty for her, but the chili is in fact a very spot-on copycat. Plus I love serving it with my Jalapeno Popper Cornbread Muffins. Wendy’s Chili seems like it would be a tough recipe to make, but honestly the most difficult part is waiting for it to cook low and slow. 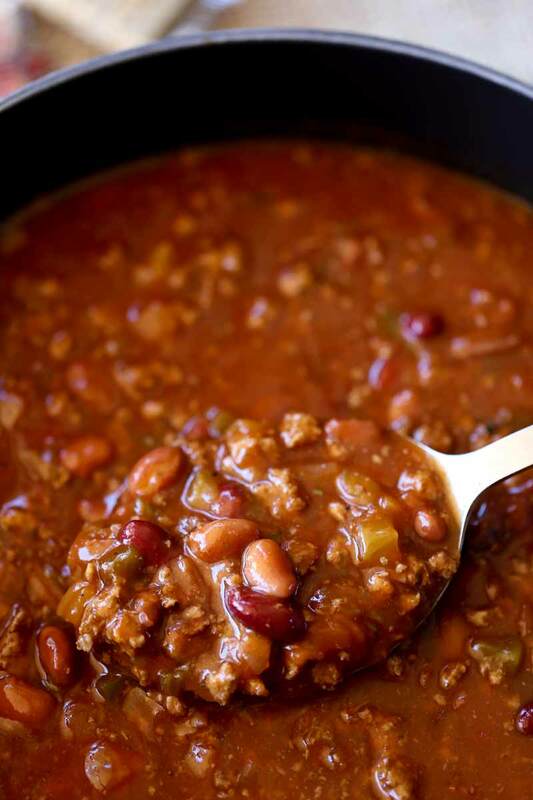 In fact here are some tips and tricks for making this the PERFECT chili recipe. Add in a tablespoon of butter at the end of cooking. It helps mellow flavors and provide the best texture. It adds a richness with minimal calories (it is only 1 tablespoon for the whole pot!). Cook on a “simmer” which is lower than “low” usually. Cooking on a simmer is just the smallest of bubbles. 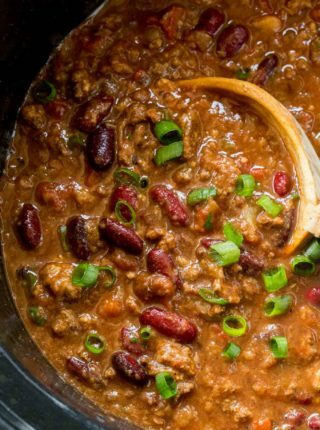 If you find your chili doesn’t look the same as below you may have the heat on too high so too much water has evaporated or on too low and too much water is remaining. If you’re nervous about cooking it uncovered just stir more frequently. You’ll be able to feel if any of the chili is sticking to the pot. 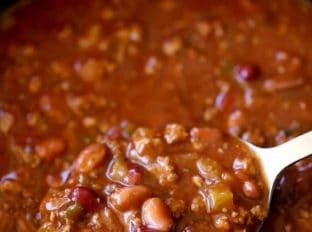 Slow Cooker Wendy’s Chili Recipe? Brown the beef before adding to the slow cooker. Add in the rest of the ingredients and cook on low for 8 hours or on high for 4 hours. Cast Iron Dutch Oven: Great heavy bottomed pan is amazing for low, even cooking and high quality for not a lot of money! Plus the lid is a second pan! Pot Strainer: MY LIFESAVER. I strain everything in a pot through this and it is SO MUCH easier than a colander. Perfect for cooking 1 pot meals. 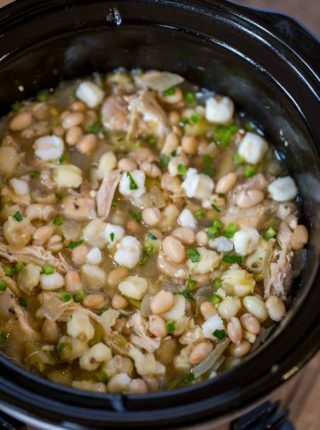 Pinto Beans: I also use this variety with jalapenos when I don’t want to go to the store for fresh jalapenos. Kidney Beans: My favorite for salad toppings too, this variety is my favorite. In a heavy bottomed stockpot brown the ground beef. Add in the rest of the ingredients (except the butter) and bring to a boil. Lower to a simmer and cook uncovered (please keep at a simmer level) for 2 hours stirring occasionally. Add in the butter and stir until fully melted and incorporated. Made the chili recipe today. I used a red pepper rather than green. The chili is wonderful. This recipe is a keeper. Let me start by saying two things. 1) I. Hate. Chili. and 2) I am not a rate/review kind of person, and this is actually probably the first time I have ever done it, but I feel this needs to be said. I LOVED this recipe! I just had left overs for dinner and I already cannot wait to have it for lunch at work tomorrow. I’ve shared it with three people today alone because I am so impressed with it. We put it together in the Crock-Pot Tuesday evening (today is Thursday), put it in the fridge, and cooked it on low for 8 hours yesterday. Aside from a couple recommendations by other reviewers, we made it exactly as it says and we we won’t change a single thing when making it next time. The only things we changed was draining the beans, as someone said it makes it chalky or pasty I believe, and then we cooked the meat with the cumin, salt, pepper and 1/2 of the chili powder. I had never heard of using butter in chili, but I dropped it in the Crock-Pot just before serving since I wanted to follow the recipe as much as possible. I don’t know if it did anything or not, but again the final outcome was so perfect we will continue using it. 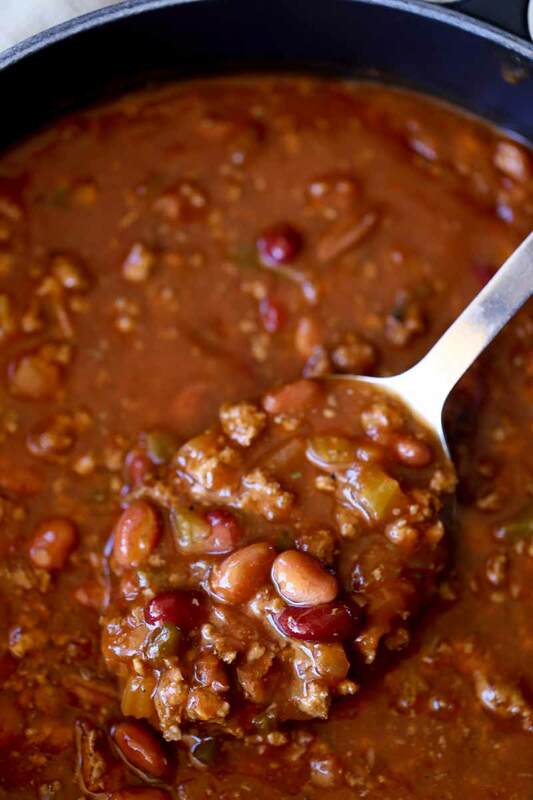 My wife, a chili lover, thanks you for finally giving me a recipe I will make for her! Yay!! Your comment just made my day! Thank you so much for coming back to let me know. This is my go to recipe when I want some lovin..Lol. I learned to use pickled tamed jalapenos for the taste and barely any heat. Thanks for this! Hello Sabrina, I have just searched up fro simmering 2 hours on stove, to cooking a instant pot 40mins high pressure. I haven’t tested it so I’m not really comfortable giving a recommendation. You might be able to find a recipe online with similar ingredients to follow as guideline. Good luck! Can you email me detailed instructions please? Thanks! No, you brown the beef alone then just add everything else in together. No need to add the vegetables to the beef. Wendy’s does not caramelize the vegetables in their chili. 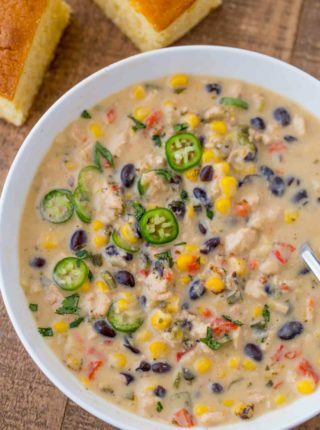 Great recipe, simple to make, Just the right amount of kick to it and I’m not even a big chili person but the family is and they love it. 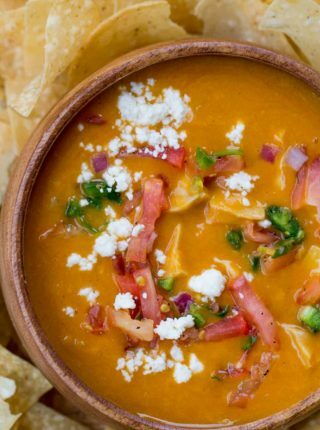 I love that you DON’T drain the beans. There is so much flavor and nutrition in them. I never drain my beans and it always turns out so flavorful and delicious and it adds body!! The gas equation is nominal. I’d rather have the flavor and nutrition for sure!! at all because the result of this recipe is a really really good chili. I’m not a fan of spicy hot food, but even with the jalapeno this chili has only a mild kick. The only thing I did differently was, I drained and rinsed the beans and replaced the liquid with an additional cup of water. This recipe is easy to make (I’m a bachelorette with a crockpot, lol). My only warning is, if you’re going the crockpot route, you need one that’s at least 7qts to make the recipe as measured. Thank you for this recipe, it’s a keeper. I’ll be eating chili more often, for sure. I followed the recipe except for cutting the chili powder in half. I can tell the flavor was good, but it was extremely salty for us. I will use less salt and less cumin the next time. 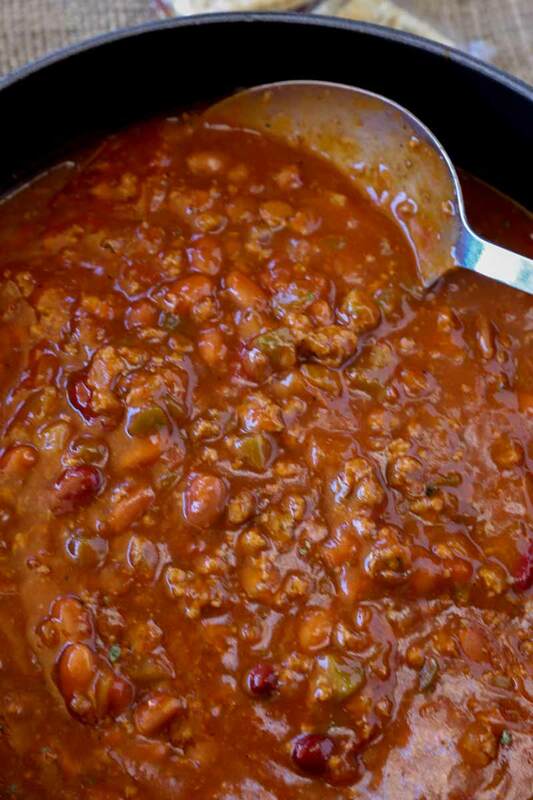 Me and my 11 yr old granddaughter made this today, both my daughters and granddaughters love Wendy’s chili, my youngest daughter is pregnant and craves Wendy’s chili almost daily.. needless to say this recipe was a HUGE hit today with my entire family and a few friends that were over today, so much so I had to go to the grocery store and buy more ingredients to make a double batch if this chili tomorrow for the football game and for the up coming snow storm we’re getting.. and for me the most important thing about this recipe is my granddaughter who is 11 is able to follow the recipe and basically make it on her own with my guidance of course. Thank you for giving us all the better than Wendy’s chili recipe.. So glad everyone enjoys it! Thanks for the 5 stars, Sasa! Ok so I’ve been making this every week and it’s absolutely delicious. This is my second post. The reason why I’m posting again is because I’ve been making this a “crock pot” meal. So on that note – when making this in the crock pot; Completely omit the water. You don’t need it at all. Thanks for sharing this perfect recipe! Yummy! This is DELCIOUS! 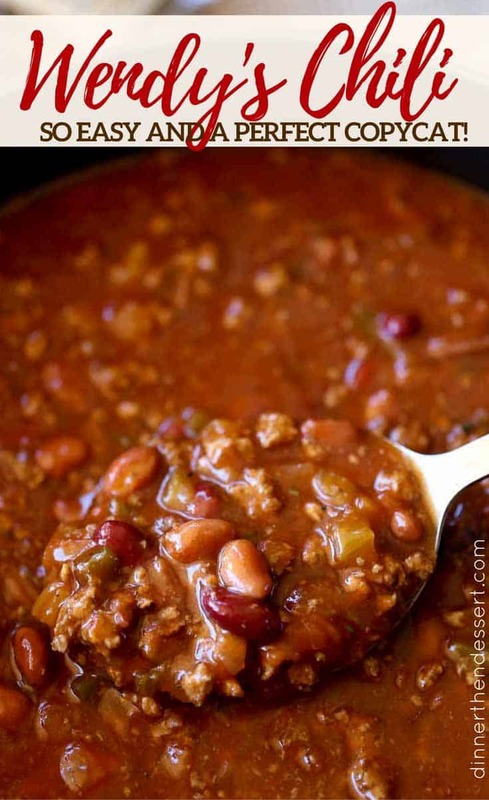 I am a huge fan of Wendy’s chili and this is so close to their recipe. My family loves it, no matter if it’s 100 degrees outside or if it’s 30. I make this often!